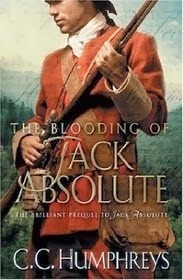 The Blooding of Jack Absolute is the prequel to the first book, Jack Absolute, in a series by C.C. Humphreys. There's also a third book, Absolute Honor. The Blooding of Jack Absolute is available at Amazon and Barnes and Noble. From the billiard halls and brothels of London to a clash of Empires on the Plains of Abraham, Jack life is forever altered by the tragedies of that night. Through duels, battles, frantic escapes and a brutal winter spent in a cave in Canada, Jack learns the truth of his father's words...as well as a dozen things to do with a dead bear. A year on, the schoolboy will vanish, a man appear. But first he must learn to kill. To come of age, Jack Absolute must be blooded. I hadn't read any of the other books in the series before I read this book but I was intrigued by the blurb so I requested a free advanced copy from NetGalley. Then, I bought the second book in the series because I enjoyed this one so much. The problem with a prequel is that there's no real threat - you know who survives because of the next book, but there's enough action here to not make that an issue. There may be panic-triggers for some women in this book. Wannabe-Men have made me afraid of men, but it's Real-Men who keep reminding me that not every guy is a Wannabe. Jack, despite his youth, acts like he will be a Real-Man when he grows up.